FRIENDS have been updated to a twin axle design - to increase range - while retaining the best and optimum 13.75 degree cam angle for consistent placement strength. Wide machined cam lobes provide more friction in smooth and hard rock and also less damage to soft rock. Clipable thumb loop, flexible single wire stem & extendable sling round out the package. Notable too is the hollow axle that not only saves weight but increases the bearing surface that the cams rotate upon... for silky smooth triggering. Cam springs are graded, balanced and firm for maintaining placement position and to resist "walking". FRIENDS have a narrow profile which allows them to fit into tight spots - like pockets and constricting cracks. Each FRIENDS "footprint" increases with each size so stability is maintained in wide cracks. Details include "bullet" swages on control wires to eliminate snagging on other gear and increase durability. The ever so popular extendable Dyneema Slings - saves a carabiner & draw at each placement and assures the lightest possible combined weight! 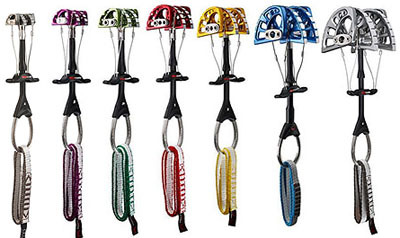 6 overlapping sizes simplify your rack and colors align with other popular cams. The NEW FRIENDS are the best FRIENDS yet! Made in Taiwan.